The Maoists, including a woman, laid their arms before Senior Superintendent of East Singhbhum district police Anoop T Mathew in Kanhu's native village Jiyan. JAMSHEDPUR: Seven major Maoist leaders of East Singhbhum district, who carried altogether Rs 43 lakh rewards on their heads, surrendered before the police today. Among the seven, police said, were Kanhu Munda and Fogra Munda, who were carrying rewards of Rs 25 lakh and Rs 10 lakh on their heads respectively, police said. Four other cadres carried rewards of Rs 2 lakh each on their heads. The Maoists, including a woman, laid their arms before Senior Superintendent of East Singhbhum district police Anoop T Mathew in Kanhu's native village Jiyan under Gurabandha police station area in Ghatsila sub-division. DIG (Kolhan) Prabhat Kumar described this as a big achievement for the district police. 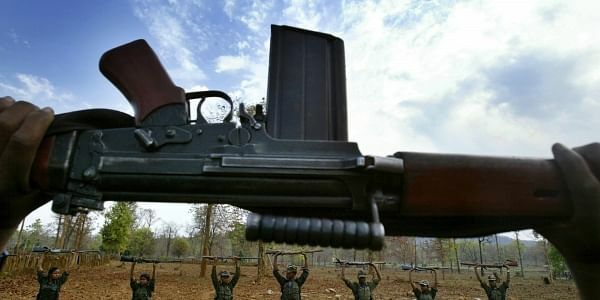 A Zonal Secretary of Jharkhand-Bengal-Odisha zone of CPI(Maoists), Kanhu, who joined the Naxal movement about two decades ago, was operating in Ghatsila sub-division including bordering areas of West Bengal and Odisha, police said. Kanhu and Fogra were wanted in a number of Naxal-related incidents including the murder of police inspector Sushil Nag and three others in Singhpura under Gurabandha police station area in 2006.